TO DATE, THE only public evidence that the Russian government was responsible for hacks of the DNC and key Democratic figures has been circumstantial and far short of conclusive, courtesy of private research firms with a financial stake in such claims. Multiple federal agencies now claim certainty about the Kremlin connection, but they have yet to make public the basis for their beliefs. Now, a never-before-published top-secret document provided by whistleblower Edward Snowden suggests the NSA has a way of collecting evidence of Russian hacks, because the agency tracked a similar hack before in the case of a prominent Russian journalist, who was also a U.S. citizen. 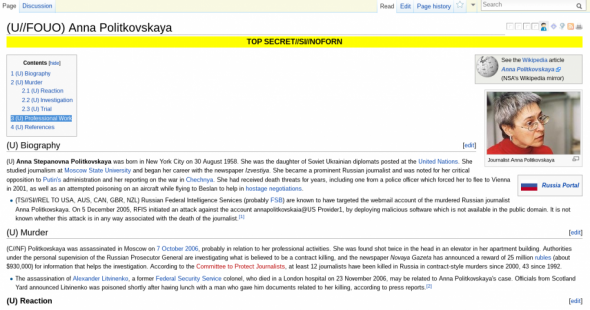 Russian Federal Intelligence Services (probably FSB) are known to have targeted the webmail account of the murdered Russian journalist Anna Politkovskaya. On 5 December 2005, RFIS initiated an attack against the account annapolitkovskaia@US Provider1, deploying malicious software which is not available in the public domain. It is not known whether this attack is in any way associated with the death of the journalist. Although the NSA document does not specify the account, Anna Politkovskaya was known to use the email address annapolitkovskaia@yahoo.com. 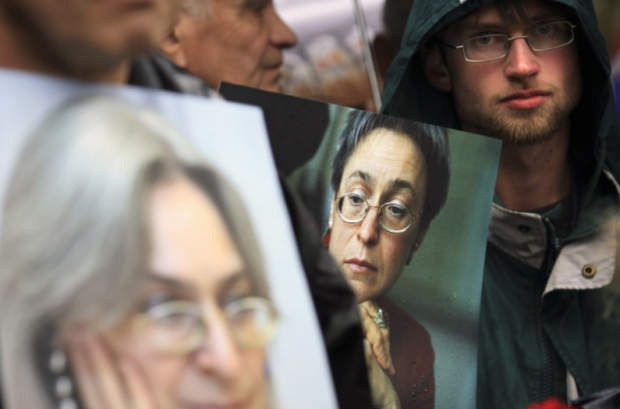 The year after her email was hacked, Politkovskaya was murdered, a crime that was widely suspected, though never proven, to be a Kremlin reprisal for her reporting on Chechnya and criticism of Vladimir Putin. This hack sounds more or less like a very rough sketch of what private firms like CrowdStrike allege the FSB perpetrated against the DNC this year, and presumably what entities like the Federal Bureau of Investigation, the Central Intelligence Agency, and the Office of the Director of National Intelligence have, behind closed doors, told President Obama took place. What’s particularly interesting here is the provenance of NSA’s claims: The section is classified TS/SI, meaning Top Secret Signals Intelligence, the interception of signals (broadly construed) as they pass from one point to another, including anything from tapped phone calls to monitored internet traffic. That is to say, the NSA knew Russia hacked Politkovskaya because the NSA was spying. Thanks to the Snowden revelations, we know there are many powerful, overlapping government spy programs that could allow the NSA to observe communications as they unfold. Unfortunately, in the case of this wiki there’s no indication of exactly what sort of SIGINT was collected with regard to Politkovskaya, or how it incriminated Russian intelligence — all we have is the allusion to the evidence, not the evidence. The NSA declined to comment. But that this evidence existed at all is important, and more so today than ever. Simply, the public evidence that the Russian government hacked the Democrats isn’t convincing. Too much of what’s been passed off to the public as proof of Kremlin involvement is based on vague clues and educated guesses of what took place. Signals intelligence could bridge the empirical gap. Adm. Mike Rogers, the current NSA chief, has already publicly claimed that Russia was behind the attack. “This was a conscious effort by a nation state to attempt to achieve a specific effect,” Rogers said in November, without specifically mentioning Russia. Signal interception can take many different forms, and again, there’s no way to know exactly what the NSA had intercepted surrounding Anna Politkovskaya. But we know intelligence is being gathered on a fine enough level to pin the breach of a single inbox on the Russian government. If the NSA could use signals intelligence to track a specific hack of an American email account in 2005, it’s not too much to assume that, 10 years later, the agency possesses the same or better capability. And signals intelligence is the type of evidence that the American people are owed from the federal government today, as we contemplate a possible confrontation with Russia for interfering in our most important of democratic processes. The assumptions in the last line of the article are just wrong. No one interfered with our democratic processes. They have been dismantled, from within, in a very bipartisan way. And if our elections and data are at risk, if hackers and leakers can interfere, it is because the system is not accountable or transparent. Mostly, we hear in this fake news event the dying howls of the grand wurlitzer. Thanks to this organisation and many others, we are establishing a new media.